• "I Ring For Peace - The Bells at Stanford" (PDF, 1.3MB). This article was sent to Watkins in spring 2007 from the Guild of Carillonneurs. • Please enjoy a stirring editorial comment written by VUU Alumnus, Rudolph Hickman, Class of 1972. RECOGNIZING BELLS FOR PEACE, INC.
• Mr. SCOTT of Virginia. Madam Speaker, I rise today to recognize Bells for Peace, Inc., a non-profit, charitable organization founded within my district in Richmond, Virginia. Bells for Peace is dedicated to enriching the history of Virginia Union University by restoring the University's prominent cornerstone, the Belgian Friendship Building and its Vann Memorial Tower. • Bells for Peace was founded on December 8, 2004 in Richmond, Virginia by Mrs. Diane Watkins, its current President. The organization was created in memory of the late Dr. John Malcus Ellison, Sr., the first African American President of Virginia Union University, and his wife, Mrs. Elizabeth Balfour Ellison. Dr. Ellison was dedicated to bringing peace and unity to the cultural divide within this country, and he believed a multi-cultural education could be used to achieve this. Bells for Peace is an effort to carry on Dr. Ellison's life's work. • As part of this effort, Bells for Peace hopes to install a 35 bell carillon in the University's empty Vann Memorial Tower, which sits atop its Belgian Friendship Building. In 1939, the Belgian Government presented the Friendship Building and Tower to Virginia Union in a gesture of international goodwill. The Friendship Building had been the centerpiece of the Belgian Pavilion at the 1939 World's Fair in New York. However, prior to presenting the structure to Virginia Union, the Belgians removed the bell carillon and awarded it to President Herbert Hoover. President Hoover gave the carillon to his alma mater, Stanford University, where the bells now ring at the Hoover Institution of War and Peace. • The Belgian Government selected Virginia Union for the gift from 27 colleges that desired the Friendship Building and Tower. 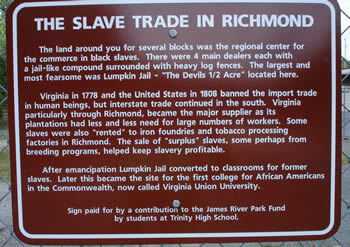 Virginia Union was selected because of its location, history, and mission. Where better to place a symbol of peace, hope, and unity than in Richmond, Virginia, the former capital of the Confederate states that nearly burned to the ground when the Southern troops fled the city. Where better than on a campus that was first located in a rented structure known as Lumpkin's Jail, a former slave holding pen. And where better than at a University that was born of several small colleges dedicated to the dignified education of African Americans, while struggling against post-Civil War prejudice. In 1899, these colleges joined together in a ``union'' that opened its doors as Virginia Union. The Belgian Government recognized this significant history and felt that its ``Friendship Building'' would be best served on the shores of the James River in Richmond. • Following the Belgian Government's decision to give the structure to Virginia Union, Dr. John Malcus Ellison single-handedly raised $500,000 in donations to transport and re-construct the Friendship Building on the Richmond campus. Shortly thereafter, the Friendship Building was used by the U.S. Armed Forces as the Eastern Virginia induction site for soldiers going off to fight in WWII. 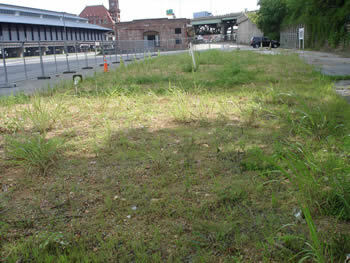 It was within this building that thousands of African American soldiers were processed into the military. 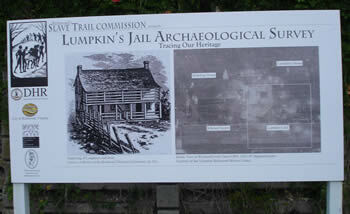 It was also through this building that the late Vice Admiral Samuel L. Gravely frequently passed. Vice Admiral Gravely, a Virginia Union graduate, was the first African American to achieve the rank of Admiral and command a Naval fleet. 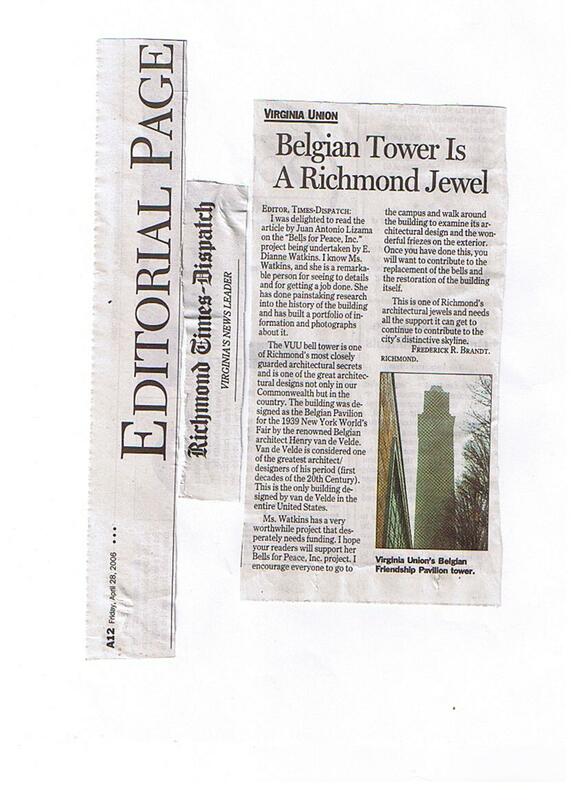 • Because of its remarkable history, the Belgian Friendship Building has been designated a United States National Treasure and Virginia Historical Landmark, but its majestic tower, which can be seen from many vantage points in the Richmond community, remains empty and silent. Bells for Peace, in its quest to obtain a new carillon for the Vann Memorial Tower, hopes to change that. Bells for Peace is also working to restore the aged and worn Friendship Building, so that it may become a top-quality facility for students pursuing a multi-cultural education. • Through its restoration efforts, the organization has brought much deserved attention to this historical landmark and highly respected Virginia Union University. Bells for Peace calls on people to recognize the importance of an international ``Friendship'' building and symbol of peace, hope, and unity erected at a historically black college; a college known for its multi-cultural studies and graduates who have made contributions to communities around the world. Bells for Peace calls on people to remember the legacy of Dr. John Malcus Ellison, who not only helped bring the Friendship Building to Virginia Union, but also helped established the University's reputation for excellence in education. • Madam Speaker, today it is my privilege to recognize Bells for Peace and commend it for its admirable mission. I also wish the organization great success in restoring the Belgian Friendship Building and filling the belfry tower with a carillon of bells that can be enjoyed on the Virginia Union campus and in the Richmond community, and symbolically heard in communities around the world.